The Carefree Way: Happy 4th of July! Today is the day to show the pride we have in our great country. Fly your flag proudly and be thankful for those who shaped this great land. What could be more American than Converse Chuck Taylor shoes? I didn't agree with a lot of his positions, but today we lost a great American, Jesse Helms. 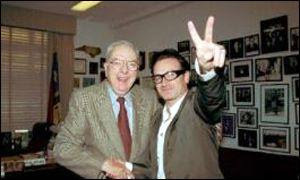 Here is the former senator with Bono of U2, which most would agree is a strange grouping. Bono is a fairly outspoken liberal, but the two were friends and worked to help fight AIDS in Africa. And finally, a quick shout out for another beloved American. We lost Charles Kuralt eleven years ago today, and he's another great American that died on a very fitting day. There's a great quote from Charles Kuralt in the sidebar on this page. You know we also lost both John Adams and Thomas Jefferson on July 4th 1826, 182 years ago.